The first president of Egypt elected in a democratic process, President Mohammed Morsi, was overthrown by a military coup on Wednesday. The president and over 300 hundred members of the Freedom and Justice Party (FJP), the political organization of the Muslim Brotherhood, are in custody. The political situation is very confused. 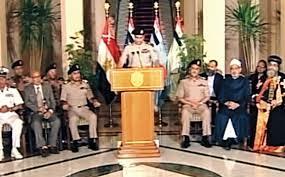 The Egyptian army is trying to form a transition government, but no one knows how long it will remain in power and no one knows if, when this government holds new elections, they will be democratic or not. In any case, whatever the political evolution is in the near future, Egypt's economy is in such a disastrous situation that the new rulers cannot wait until political order and stability are established. They face urgent decisions, particularly the implementation of a stabilization program supported by the International Monetary Fund (IMF). Morsi's government was negotiating such a program before the military coup. I was reading here and there that Egypt's economy was not doing well, before as well as after the revolution that ended the dictatorship. While I was watching the military coup happening on live TV Wednesday evening, I realized that I know almost nothing about the economics of this unfortunate country. A rapid overview of World Bank (WB) and IMF data on Egypt convinced me that the situation is worse than I thought. Let's start, as usual with economic growth, which is the key economic parameter for most others. In 2011, the year of the revolution, Egypt's gross domestic product (GDP) grew by only 1.8 percent, but the fresh democracy did not help that much, as growth was limited to 2.2 percent last year. For this year, the IMF estimate is only 2 percent. A WB note published in April noted the main problems quite well: “Egypt's economy is still suffering from a severe downturn and the government faces numerous challenges as to how to restore growth, market and investor confidence. Political and institutional uncertainty, a perception of rising insecurity and sporadic unrest continue to negatively affect economic growth.” The result is undeniable: The share of investments in GDP declined from 21 percent in 2011 to 13 percent in 2012. Since population growth is about 1.8 percent, this level of growth means more or less a stagnation of per capita income and, quite naturally, a rise in unemployment. It had remained at 9 percent before the revolution and recently went up to 13 percent. This made poverty worse, as might be expected. The poverty rate, estimated at 17 percent in 2000, was already on a rising trend, reaching 22 percent in 2009 and 25 percent in 2011. The rate for 2012 is not yet available, but we can guess at the progression given the poor economic performance. The accumulation of social problems is, for sure, one of the main factors behind the massive discontent of Egyptians. The social situation cannot be improved overnight, and an economic collapse is quite probable. Indeed, the macroeconomic imbalances are so deep that Egypt actually faces a disastrous economic meltdown. The budget deficit rose to 11.4 percent last year, from 10 percent in 2011 and the public debt ratio remains at 86 percent. For the sake of comparison, let me remind you that these figures are approximately 1.8 percent and 38 percent, respectively, for Turkey. Egypt's current account balance went from positive to negative in recent years, and its ratio to GDP is not very high (slightly over 3 percent, while Turkey's is over 6 percent). Since the already low central bank reserves are evaporating, they are currently able to cover only two-and-a-half months of imports. How will the new rulers of Egypt handle the economic situation? The most urgent problem is to restore investor confidence, and the best way to do this is to sign an agreement with the IMF as soon as possible. The most critical issue will be sizeable cuts in the huge and ill-targeted energy subsidies that have reached as much as 6 percent of GDP, in order to decrease the huge budget deficit. At the same time, public spending has to be restructured to put a social safety net in place and direct more resources to investments in infrastructure, education and health, as pointed out by the IMF. We will see if the new rulers will be capable of this difficult maneuver. If not, the responsibility for the economic meltdown will be put on the shoulders of the new rulers, and we should be ready for the triumphant comeback of the Muslim Brotherhood in the future.